The Eshel Kids: BBQ'ing all day long! 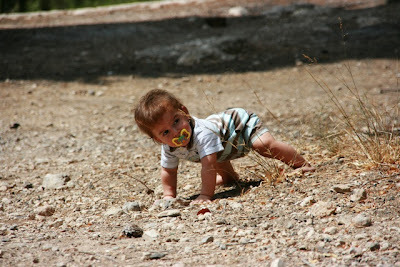 I'm still a baby, and I love to play outside - at my age it still means that I crawl where ever I want to go to. The outside is a bit rough, stingy and scratchy - but I am a BOY and boys don't care about that! Anyway, it was a lot of fun being the whole day with my family and all the other nice people over there (there were even some babies younger than me - so I wasn't the youngest around...), whenever I was tired or thirsy mommy or daddy always helped me get what I needed, but daddy never agrees to give me his glasses - which is too bad, since I like to break glasses. I ate some pita, a little chicken, a pickle and lots of watermellon! dirt is very interesting, my sister Mia keeps on bringing more of it to me and putting it on my head, I think (she told me) that this is supposed to be funny, but lately I'm not so sure of it - it gets anoying after a while. and mommy always wants to wash me - now, water I DO like! Enjoy the pictures (daddy forgot to bring a camera, but his friends didn't).